NEW YORK - They left home in first place. They limp home looking up at the suddenly ferocious Tampa Bay Rays, seven down in the All-Important Loss Column (AILC). This is 2008. This is the new reality. A dreadful trip ended in a truly dreadful way, the Red Sox squandering a nice start by Tim Wakefield, unable to hold leads of 3-1 and 4-2 and eventually losing by a 5-4 score when rookie Brett Gardner, getting his shot at playing left field because Johnny Damon has gone on the disabled list for the first time in his career, delivered a two-out single off the glove of a diving Alex Cora to bring home Robinson Cano with the winning run in the bottom of the 10th. Jonathan Papelbon and the rest of the Red Sox thought they had the kid out on strikes two pitches before, but ever-controversial plate umpire Laz Diaz disagreed. But give the kid credit for spoiling good pitches before putting the eighth Papelbon delivery solidly in play when nothing else would do. It was a great at-bat, period. Which is far more than can be said for Manny Ramírez, who, when summoned to pinch hit against Mariano Rivera with the potential go-ahead run perched on third with two away in the Red Sox ninth, watched three consecutive Rivera offerings enter the strike zone without once swinging the bat. So much for a Manny Being Manny road trip on which he went 6 for 32 with 12 strikeouts and made headlines for shoving traveling secretary Jack McCormick to the floor. This was the 1,999th regular-season game between these two great rivals, and it featured one of the more curious pitching matchups in their 108-year history. It would be quite difficult to imagine two more contrasting pitchers than 41-year-old Wakefield, who barely would put a dent in a birthday cake with his knuckleballs, and 22-year-old Joba Chamberlain, whose low-end fastball is in the mid 90s and who can crash into triple figures on occasion. Chamberlain's first pitch was a 94-mile-per-hour fastball for strike one to Jacoby Ellsbury. Wakefield's first pitch was a 66-m.p.h knuckler to Gardner for ball one, the ball eluding catcher Kevin Cash. So the basic idea was established, both ways. Before the first inning was over, Chamberlain would get it up to 99 m.p.h. (a 1-2 pitch to J.D. Drew). One fastball was recorded at 91 out there on the big board, but most of them ranged from 94 to 98. He mixed these heaters and uberheaters with an effective slider, holding the Red Sox to one hit, a Kevin Youkilis leadoff single to right in the second, through the first four innings. Wakefield's M.O. was a bit different, but no less effective. Alex Rodriguez did line a knuckler into the left field seats for career home run No. 536 (tying Yankees icon Mickey Mantle) in the second, but he retired 13 of the next 14 before Gardner lined a sixth-inning single to center one pitch after manager Joe Girardi was informed by Diaz that he'd be watching the remainder of the game from the Yankees clubhouse for questioning the arbiter's ball-strike judgment. The fleet rookie stole second and scored on a Derek Jeter single. Jeter reached second on a wild pickoff attempt by Wakefield, but Wake lucked out when Julio Lugo made a leaping catch of a scorched Bobby Abreu liner and turned it into an inning-ending double play. Thus did Wakefield enter the seventh inning for the eighth consecutive time, a feat no other Sox starter can come close to matching, at least not this season. Since the last week of May, Wakefield has been the team's most reliable pitcher. In those eight starts, Wakefield has gone 56 1/3 innings, allowing 43 hits and 16 earned runs. He is notorious for alternating hot and cold stretches, and this is a hot one. The problem is he doesn't have very much to show for it. In this stretch he's had two wins, three losses, and three no-decisions, including last night. But the modern idea in baseball is not for any specific pitcher to get a W. It's to keep his team in the game, and each starter did that last night. Yes, the Red Sox got three runs off Chamberlain and were able to get him out of there after six innings and 101 pitches, but they didn't exactly knock the sturdy young phenom around. In the fifth, they did come up with professional-at-bat singles by Youkilis and Sean Casey, a pair of walks (Joba's biggest issue thus far), and a two-out RBI single by the irrepressible Dustin Pedroia, who has now hit in 14 straight games. The Red Sox reached rookie Dave Robertson for an insurance run in the seventh when Lugo reached second on an infield single and attached Jeter throwing error and scored on a Cash double down the left field line. But for what seemed like the 27th time on this horrid trip, the bullpen could not nail things down. Wakefield handed over a one-on, one-out situation to Javy Lopez in the seventh, and two batters later the game was tied following a Jorge Posada single and a Robinson Cano gap triple to the 385 sign. 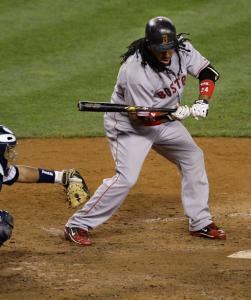 The Red Sox ninth was painful. Casey started things off with a single off Rivera. Coco Crisp sacrificed pinch runner Brandon Moss to second, and when pinch hitter Jason Varitek broke a bat with a nubber to Rivera, Moss was standing on third with two away and here came Manny striding to the plate. Neither principal kept the 54,922 in suspense. Mo pounded the strike zone and Manny watched them all go by. That was it. The fateful 10th began when Cano singled to center off Papelbon. Melky Cabrera got the sacrifice job done. But Papelbon utterly dismissed pinch hitter Wilson Betemit with some serious heat and then quickly got ahead of Gardner. But the kid hung exceedingly tough, caught a break on that tantalizing 1-2 pitch ("I knew it was out [of the strike zone]," he noted, "but I had to hope he'd call it"), fouled one more off to the left, and then hit a ball up the middle. Cora made a dive, but the ball caromed off his glove, and Gardner had his third career RBI, and first game-winner. "I was trying to talk the ball up the middle," he said. There you have it. The Red Sox went 3-7 on the trip. The Rays are feeling absolutely fantastic about themselves, and even the Yankees are in much better spirits than they were 48 hours ago. Welcome to 2008. We'd better table the Duck Boat talk for a little while, don't you think?